With the weather being as glorious as it has these past few weeks it has really got me considering my fragrance picks a little more, as i've been pulling out my favourite summer scents and i've also been on the hunt to find new scents for summer. I thought i'd share a few picks that i've recently come across, whilst doing something a little different to the usual by featuring a few fragrance picks for the men out there too! If you're anything like me then you will love any type of fragrance that just screams summer, as i'm all about those fragrances labelled 'summer in a bottle', however when it comes to male fragrances I like to think that men stick to what they know taste wise and often play it safe with a few favourite scents but i've come across some lovely scents that I think would be perfect for any man this summer. A brand that i've heard a lot about recently when it comes to perfume for men L'Occitane are hitting the mark, especially when it comes to their men's fragrance as they have an amazing selection to choose from, of which are tailored to a variety of different tastes and is a brand I think a lot of men haven't really heard about unlike us girls! A firm favourite of theirs, of which a few of my male friends like is their Vetyver Eau de Toilette (£46), which is a very classic manly scent which boasts notes of wood, rosemary and nutmeg all blended into one to create a very masculine fragrance that i'm sure any man would love. Another fragrance that I thought would be more summer appropriate is their Citrus Verbena Fragrance (£46), which as the name suggests is a lemon based scent with notes of grapefruit and lemon that come together to create a lovely summery fresh scent, that is totally different to any male fragrance i've come across before and is one of which I quite like the sound of for myself! One thing I personally like about L'occitane's fragrances is their packaging as they aren't overly fussy, and exude an element of class and sophistication, whilst also being minimal and clean at the same time. If you're thinking of treating the man in your life to a new fragrance, or you yourself are looking for a new fragrance for summer that is affordable but of amazing quality then i'd definitely recommend checking out L'occitane men's fragrance range! 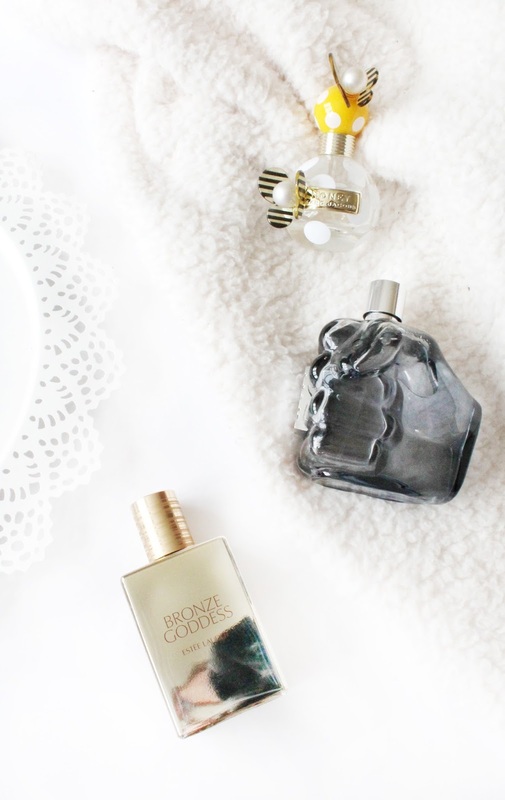 As for women's fragrance, i'm all about those sweet scents that are totally different to the typical scent that I usually go for and over the years i've discovered a couple that I will forever repurchase. First up has got to be one of my favourite fragrances of all time which is Marc Jacobs Honey Eau de Parfum (£50), which as the name suggests is a beautiful sweet scent that has a honey like twist to it. It has a lovely mix of floral notes including orange blossom and honey suckle, with peach, apricot, vanilla and honey to create a beautiful summer scent that any girl would love! Another scent I absolutely adore is the Estee Lauder Bronze Goddess (£57) of which if you have been living under a rock then you are seriously missing out because this is basically holiday in a bottle. For me it smells like a mix of sun tan lotion, with coconut cocktails and vanilla ice cream all mixed into one. What is also great about this fragrance is that it is limited edition to summer time, and every year they come back with a slightly new bottle making each version as limited edition as they can! If you've not tried this fragrance before then i'd highly recommend it! What are your favourite summer fragrances? *This post is part sponsored by Spot Digital. Read my full disclaimer here.